Home//News/News The Axis of Evil Just Got a New Brother! I’m sure you have all followed the story that was made popular for common consumption by our movie, The Principle, that the universe is not as homogeneous as the Big Bang model predicts. If this doesn’t mean much to you, let me give you an illustration that will help you see the astounding significance of this phenomenon. Think of “homogeneous” as you would homogenized milk. Before most of you were born, I remember receiving, at my humble home in New Jersey, milk in glass bottles from the milkman who delivered them every day from his truck. When we opened the milk container, it had a layer of milk fat on the top, and sometimes there were lumps of fat throughout the container. We had to shake up the milk so that the fat would dissolve. A few years later, milk companies figured out how to “homogenize” the milk so that when they delivered it to you it had no fat globules. The fat was evenly distributed so that you couldn’t tell one part of the milk from the other. The Big Bang wants to have something like homogenized milk. The Big Bangers believe that the tiny particle that exploded 13.7 years ago would spread fairly evenly through the universe. The universe would certainly have some fatty lumps, but since they would be small and spread out evenly, one couldn’t tell one part of the universe from the other. In other words, the universe would be homogeneous—the same everywhere. But in the late 1970s, scientists were gathering evidence in their telescopes that the universe was not as homogenized as they once thought. So they sent up a space probe named COBE in 1990 to check on this problem. Lo and behold, COBE revealed that there were not only huge lumps of radiation all over the universe, but these lumps accumulated in specific places. In other words, the lumps weren’t randomly located as the fatty lumps in the old milk cartons. They were on either side of a giant line that stretched from one end of the universe to the other. It would be as if you put a 12 inch ruler in your milk carton and the fatty milk deposits suddenly started clinging to the ruler. The world’s scientists couldn’t believe their eyes, so they sent up another probe to check on the first. The second one was launched in 2001 and named the Wilkinson Microwave Anisotropy Probe (WMAP). The word “anisotropy” basically means “lumps.” WMAP was going to search out where, exactly, the radiation lumps were located in the universe. Lo and behold, WMAP came back with the exact same information as COBE, but this time they realized that the “12 inch ruler” around which the fatty lumps organized themselves, as it were, was the line that forms the 23.5 degree tilt between the sun and the earth! They also found another special organization of two bigger lumps on opposite poles of the earth’s equator. In other words, if we were to extend the earth’s equator on a plane to the rest of the universe, the two largest lumps of radiation would be at opposite ends, which form a dipole, one lump at the far west and one lump at the far east, so to speak. Once again, they couldn’t believe their eyes, so they sent up another probe in 2009 named Planck. Lo and behold, the Planck probe came back with the same information, but it was clearer and more exact than the first two. There is an old saying in America: “Three strikes and you’re out!” This should have been the case with the Big Bang theory. But then, of course, all of modern academia would have come to a screeching halt. All the diplomas, all the grants and endowments, all the prestigious careers, and all the fame and fortune that comes with being a popular scientist would have been erased if all the scientists actually admitted what they were seeing in their telescopes. Instead, the most recent reports chalk up the new discoveries to “anomalies that we hope to answer someday” (a quote from the European Space Agency that sent up Planck in 2009). In fact, these scientists don’t even call it the “Axis of Evil” any longer, since that name gives it away that they don’t like what they see. But this is not all. At about the same time as WMAP, other scientists noticed that spiral galaxies were aligned and were spinning with respect to the same Axis of Evil. (Longo, 2007). Still, other scientists were studying the placement of Quasars in the universe and found that their light was polarized with respect to the same Axis of Evil. In this case, a research team, using the Very Large Telescope in Chile, discovered 93 of these polarized quasars, spanning distances over billions of light-years. The first thing they noticed was that the rotation axes of all 93 quasars were aligned with each other [parallel], in spite of the trillions of miles of distance between them. So, the natural question is, how do these 93 quasars know of each other’s existence in order to line up in the same direction? What telephone lines are they using to communicate with each other instantaneously? The even bigger question is, around what are they aligning themselves? Could it be the same Axis of Evil that everything else in the universe seems to be aligning itself? Well, for you science buffs, we have some interesting information for you. 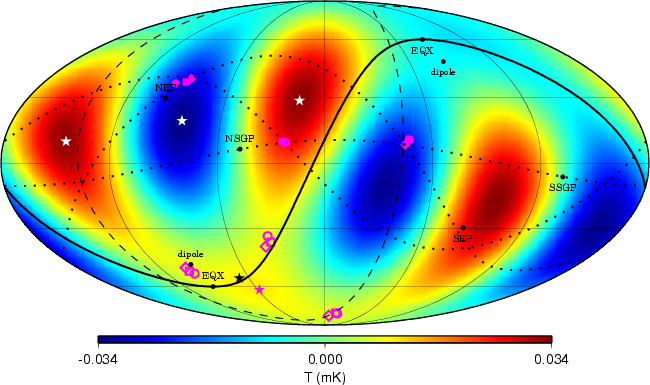 In the September 2014 paper by Hutsemékers, the section of the sky in which he concludes that the quasar polarization axes are parallel or perpendicular to their large scale background is between RA 160-170 and declination of 4-20. I should say so! If you haven’t figured it out already, what this evidence is telling us is that all the objects in the universe are geocentrically oriented, putting us in the center of it all. And Now the Axis of Evil’s Has Another Brother! Just a few days ago a report was released about black holes, which are understood to be the engines of quasars. It is believed that a black hole is at the center of every quasar. Thanks a lot Mr. Sungenis. Plaese we need more items into spanish!! !